The National Association of REALTORS® just released the new Pending Home Sales report for the US, and overall it appears as if the market showed some signs of strength. In Tallahassee, pending home sales (new contracts submitted to the Tallahassee MLS) grew 4% from February to March, and just under 1% growth year over year (March 2012 compared with March 2011). While this tiny growth not seem like much, it sure beats the falling numbers that occurred in three out of the four previous months. The real estate graph below shows pending home sales recorded as a daily tracking of the one-year trend. By recording pending home sales in this fashion, we eliminate the real estate seasonality that occurs during different times of the year. Thus any movement in the graph reflects a subtle change in the market. As the yellow arrow highlights, we have been bumping along a real estate market bottom defined as a daily average of 4 to 4.25 new contracts per day since November 2010. Had the government not interfered by implementing the Home Buyer Tax Credit, this trend likely would have begun one year earlier. 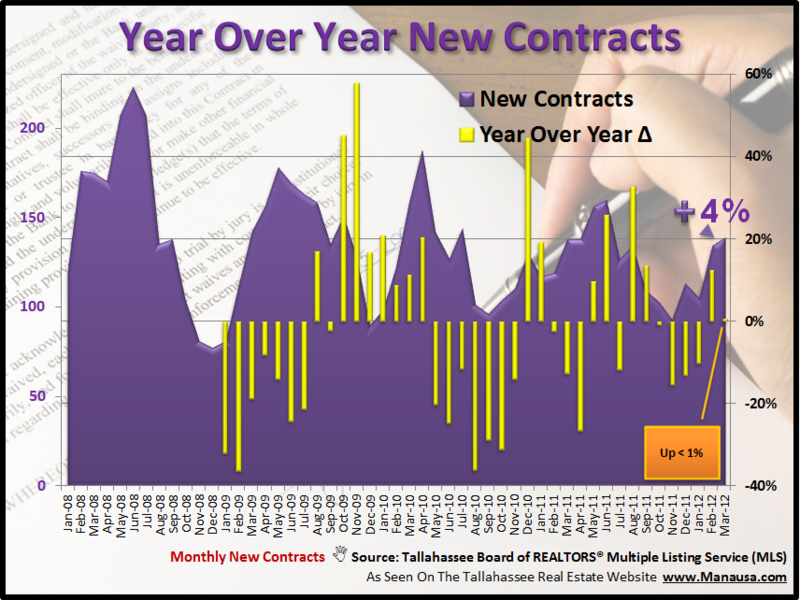 Our next real estate graph shows both the monthly changes as well as the year over year variances in pending home sales for the Tallahassee real estate market. As stated in the opening paragraph, the month of March brought an increase in both of these. The yellow bars show year over year changes to the pending home sales numbers in Tallahassee, and the reason for the poor closed home sales reports that we saw in the first quarter are clearly seen with the three consecutive declining months that lead us into 2012 starting in November. We should expect 2nd quarter closed home sales to be similar to last year, and perhaps even stronger, depending how the month of April fairs. 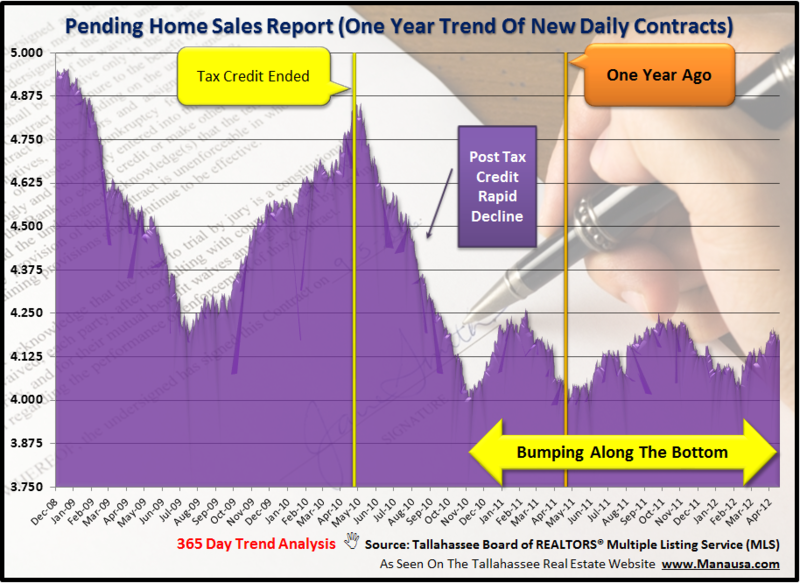 If you are thinking about selling a home in Tallahassee, this is the time to do it. Values are dropping, but buyer activity is as strong as we have seen in the past few years. Take a lesson from the pending home sales report and get your home sold now. My fiancee and I have been debating for sometime now what to do with our respective homes and how this will impact our eventual marriage. Thus far neither of us are under water and should not be even if the market drops lower than it is now. What we are concerned about is timing, logistics, and a percieved loss of value (more her than me). What we need to learn is how long should it take for us to sell our respective homes, buy a new home, and plan our wedding accordingly. She lives in Lakeside, and I live in Killearn Acres. I have two teenagers going to Chiles and I would like to not disrupt thier schooling. I know the length of time it will take to sell is directly related to the price we list the home for, the condition or our respective homes compared to the competition and how the market is doing. What else am I missing? Mark, I have emailed you my response.